WHAT: When Nick Walker (Ryan Reynolds), a dirty Boston cop with a guilty conscience, is killed during a major drug bust, he’s given the chance to redeem himself by joining the Rest in Peace Department – a group of deceased lawmen from throughout history who protect the living world from those who have escaped Hell. 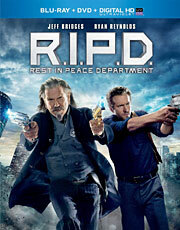 WHY: As much as I wanted to like this movie, “R.I.P.D.” just isn’t very good. Though it’s based on a comic book of the same name, the film feels eerily like the “Men in Black” series, both in tone and the dynamic between its lead characters. Unfortunately, it doesn’t work nearly as well as its high-concept premise suggests, despite a cast that includes Reynolds, Jeff Bridges, Kevin Bacon and Mary-Louise Parker. Bridges, in particular, is the only reason the movie is even remotely watchable, camping it up as a hootin’ and hollerin’ Western lawman that’s partnered with Reynolds’ morose cop. Parker has a few bright moments as their boss, but for the most part, “R.I.P.D.” represents a pretty big waste of talent on several fronts. It’s also incredibly corny, formulaic and features some awful special effects for a summer blockbuster. Still, at a brisk 96 minutes, the movie is almost worth suffering through just to see Bridges do his thing. Almost. WHAT: Mother-daughter vampires Clara (Gemma Arterton) and Eleanor (Saorise Ronan) are forced to flee to an English coastal town when they attract some unwanted attention from their own kind. After years of keeping her story a secret, Eleanor finds solace in a sulky teenager named Frank (Caleb Landry Jones), unaware of the grave consequences that doing so will have. WHY: Neil Jordan may be responsible for adapting one of the most popular vampire stories of the modern age (“Interview with a Vampire”), but that doesn’t give him license to ruin the genre with a film that completely rewrites the classic mythology. 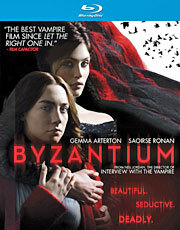 That’s because no matter how hard he tries, “Byzantium” doesn’t feel like a vampire movie at all. Fangs have been replaced by a sharp nail that extends to puncture victims’ necks, sunlight is fair game (though they don’t sparkle), and the method of turning into a vampire is terribly unsexy, unfrightening and anticlimactic. More than anything else, though, the film is just really boring. None of the characters are particularly interesting, and the brief flashbacks explaining Clara and Eleanor’s transformation feels like an afterthought. It’s a shame to see actors like Saorsie Ronan and Johnny Lee Miller trapped in such a dull movie, because “Let the Right One In” proved that it’s possible to make a great vampire film that defies conventions; “Byzantium” just isn’t one of them. EXTRAS: There’s over an hour of interviews with various members of the cast and crew, but that’s the extent of the bonus material. Tags: Blu Tuesday, Byzantium, new Blu-rays, R.I.P.D.